September 23, 2018, Zurich, Switzerland – This morning, His Holiness the Dalai Lama took a shorter drive to reach Zurich’s Hallenstadion where more than 9000 waited to listen to him. He took his seat on the throne against a backdrop of three colossal thangkas depicting the Buddha, Manjushri and Avalokiteshvara. Prayers were brief and he began to give an introduction to Buddhism. He explained how in ancient India people who remembered their past lives prompted the idea that there is a permanent, single, autonomous self that carries on from one life to the next. Common to many Indian spiritual traditions were practices for achieving a calmly abiding mind and special insight. “By cultivating calm abiding we try to eliminate the mind’s distractions,” His Holiness clarified. “Calming your mind and focussing it on a single point is developed in nine stages, which are explained in the middle volume of the ‘Stages of Meditation’. It’s necessary to avoid dullness and laxity on the one hand and excitement on the other. I know a meditator who emerged from a three year retreat and told me his mind was duller than before. He had allowed his mind to sink. The mind needs to be fully alert. It needs the intensity of alertness. “Special insight is the mind that focuses on how things are. A calmly abiding mind and special insight are found in non-Buddhist traditions that also explore the meditative absorptions of the desire, form and formless realms. “This indicates how his teachings would unfold. ‘Profound and peaceful’ indicates the nature of cyclic existence and cessation. ‘Free from elaboration,’ indicates the subtle selflessness and emptiness that would be the core of the perfection of wisdom teachings. ‘Uncompounded luminosity’ denotes the clear light described in the ‘Unravelling of Thought Sutra’ that was explained to people for whom ‘nothing has any inherent existence’ implies that there’s nothing there. Because they’d be inclined to fall into nihilism they were taught the three natures: imputed nature that implies no intrinsic existence; dependent nature that is not self-created and perfect nature that has no ultimate, independent existence. Nyengön Sungrab distinguished between the general structure of the teachings, which includes the Four Noble Truths and the Perfection of Wisdom teachings, and specialized teachings intended for specific people. Such specialized teachings include the Tantras. Monastic discipline was also part of the general structure. The Buddha gave his monks vows governing such conduct as how to wear their robes. As monks made mistakes, further vows were added. Full ordination in the Mulasarvastavadin tradition upheld in Tibet consists of 253 vows. The Theravada ordination involves 227 vows, but essentially the two traditions reflect the same discipline. His Holiness noted that there was a custom of honouring the ‘Six Ornaments and Two Supremes’, great Indian Buddhist masters of the past, which he considered incomplete. To rectify this he composed a ‘Praise to the 17 Nalanda Masters’ and commissioned a new thangka to illustrate it. He gave a reading transmission of the Praise beginning with Buddha Shakyamuni and going on to extol the qualities of Nagarjuna, Aryadeva, Buddhapalita, Bhavaviveka, Chandrakirti, Shantideva, Shantarakshita and Kamalashila of the profound lineage. Belonging to the lineage of extensive deeds was Asanga, who recorded the five texts of Maitreya, Vasubandhu, the logicians Dignaga & Dharmakirti, Vimuktisena, Haribhadra, the Vinaya masters Gunaprabha & Shakyaprabha, and Atisha. 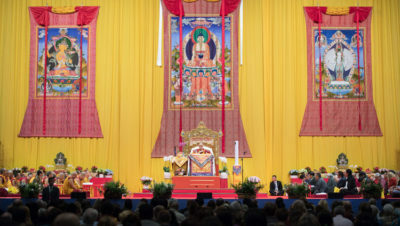 His Holiness discussed the Two Truths, conventional and ultimate truth. “My experience of emptiness is such that if I make an effort I can understand it. Relying on Shantideva’s ‘Guide’ I can see the faults of the self-cherishing attitude—cultivating bodhichitta can overcome them. This is not just an intellectual exercise. These practices have a direct impact on my disturbing emotions. His Holiness began to explain Nagarjuna’s ‘Precious Garland’. In the first verses the work mentions high status, a favourable life, which enables you to practise the dharma. Such a life is secured by gathering its causes—thirteen activities to be avoided, the ten unwholesome deeds: killing, stealing and adultery; false, divisive, harsh, and senseless speech; covetousness, harmful intent, and wrong views. Three additional activities to be restrained include drinking alcohol, wrong livelihood and doing harm. There are three further activities to be adopted—respectful giving, honouring the honourable, and love. His Holiness read rapidly through the first chapter of the ‘Precious Garland’. He then drew attention to twenty verses, starting with verse 466, that Nagarjuna recommends should be recited daily. He explained how the three volumes of the ‘Stages of Meditation’ came to be written at Trisong Detsen’s request after Kamalashila, Shantarakshita’s student, had defeated Chinese monks in debate. His Holiness advised his listeners to read and study the ‘Precious Garland’ and ‘Stages of Meditation’ and to read the ‘37 Practices of Bodhisattvas’ for guidance about day to day practice. After that he gave the Bodhisattva Vows. A financial statement was read out in relation to this session of teachings organized by the Tibetan Community in Switzerland and Liechtenstein and the Tibet-Institute Rikon. It prompted His Holiness to point out that he takes no fee for teaching, having been impressed by the example of Tseley Rangdol, who made three pledges: not to ride animals from place to place, to eat only vegetarian food and not to take any payment for his teaching. Finally, Daniel Aitken, President of Wisdom Books, requested His Holiness to release the paperback edition of ‘The Life of My Teacher: A Biography of Kyabjé Ling Rinpoché’, of which he was the author. “Ling Rinpoché gave me Bhikshu ordination and encouraged me to study the great texts, for which I am very grateful,” His Holiness declared, before leaving the hall for lunch with six Swiss MPs, Mario Fehr and the President of the City of Zurich. Later, he returned to the hall to talk to more than 6000 Tibetans and Tibet Supporters. He reviewed the ups and downs of relations with China over nearly 70 years. He compared them to the weather. It may storm and hail may fall, but that lifts and the sun comes out for some time, only for the clouds to roll in once more. He referred to the eras of the different leaders since Mao Zedong and the changes that have taken place. He outlined the development of the Middle Way Approach that he initiated and that the Sikyong has also adopted. He passed on a report of a Chinese official’s suggestion that criticizing the Dalai Lama as a reactionary splittist hasn’t gained much support and since he’s popular it might be more effective to embrace him. In his words of thanks the President of the Tibetan Community in Switzerland and Liechtenstein led the assembly in reciting a prayer for His Holiness’s long life and the fulfilment of his wishes. His Holiness laughed, waved to the crowd and left the stage.